Traditional stormwater management relies on networks of curbs, gutters and pipes to divert water from impervious surfaces and away from urban areas as quickly as possible, often directly into nearby watercourses. Although this traditional pipe-and-convey approach to stormwater management protects urban property from surface flooding during rain events, it leads to a range of unintended yet significant impacts to watercourses, including water pollution, streambank erosion and loss of fish habitat. Green stormwater infrastructure (GSI) is an alternative approach that includes a network of decentralized infrastructure to capture, detain and infiltrate rainwater as close as possible to where it falls. 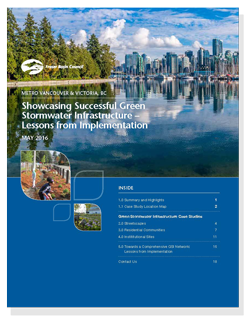 GSI includes a range of features such as bioswales, rain gardens, green roofs, pervious paving and infiltration trenches. By capturing and infiltrating rainfall, GSI slows and reduces stormwater entering the traditional piped system while also removing pollutants. GSI has been shown to improve water quality and stream health in urban watercourses. In addition to these benefits, GSI has been identified as a method of increasing the resilience of urban communities to climate change. Communities in BC’s South Coast are expected to face an increase in the frequency and intensity of winter storms. Such a trend increases in the risk of flooding from overwhelmed, aging urban drainage systems and receiving stream channels. If GSI is implemented across the urban watershed, the cumulative reduction of stormwater entering the piped drainage system can reduce the burden on receiving streams and aging storm sewer systems – thereby reducing the risk of flooding and increasing the resilience of communities to the impacts of a changing climate. FBC would like to thank all project funders: Environment Canada's Science Horizons Internship Program, Sitka Foundation, Keurig Canada and Salmon-Safe BC.